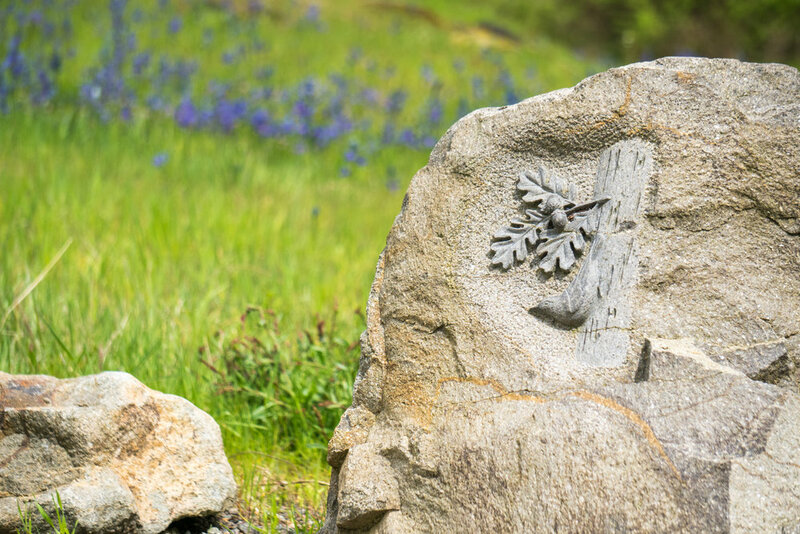 Canemah Bluff is a 300-acre natural area owned and maintained by Metro within Oregon City. GreenWorks worked with Metro to develop public access to the sensitive oak savannah and woodland, which included improving hiking & walking trails, new boardwalk, foot-bridge, and scenic overlook. During the Public Involvement phase, GreenWorks helped engage the community and gain support from a highly motivated neighborhood group. We prepared a design that reflected both Metro’s and the neighborhood’s goals for minimal impact to natural resources, yet provided for a safe place for users to enjoy the natural area. GreenWorks produced graphic presentation materials that helped convey the design so both the client and community could fully understand and appreciate what the end product would look like once built. GreenWorks designed the new Center for the Arts Plaza in downtown Gresham for the city and its non-profit partners. The plaza is the new “living room” for Gresham and features a dramatic integration of the arts using light, water and sound. Key features include “art pillars” dedicated to literature, music, performance and fine art. Additionally, an interactive public fountain, large gathering space for concerts and dynamic lighting effects enhance nighttime activity. The plaza spills out into a “festival street” along Third Street and is host to many community events such as farmer’s markets, civic ceremonies and patrons of the Center for the Arts. Portland’s first green main street, the Denver Avenue Green Street extends along the four-block historic Kenton business district in north Portland. The initial phase of the streetscape design developed an overall concept for the street section, including the widening of sidewalks, addition of bike lanes, and the restructuring of existing parking, drive lanes and medians. The design developed through input from a Citizen Advisory Committee, a Technical Advisory Committee, and with extensive public involvement at open house meetings. 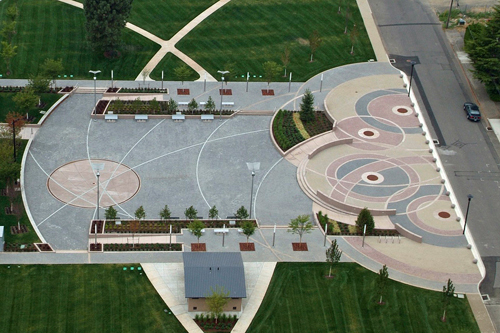 GreenWorks, as part of a multi-disciplinary team, prepared an overall street layout for the corridor that defined paving patterns, materials, street trees, site furniture, ornamental light fixtures, and the design of gateways at either end of the corridor. An important component was the integration of green street stormwater solutions within the right-of-way. This project was completed on time and on budget. Our initial design work moved successfully into a constructed streetscape project in 2010 with GreenWorks providing construction documentation led by the Portland Bureau of Transportation. 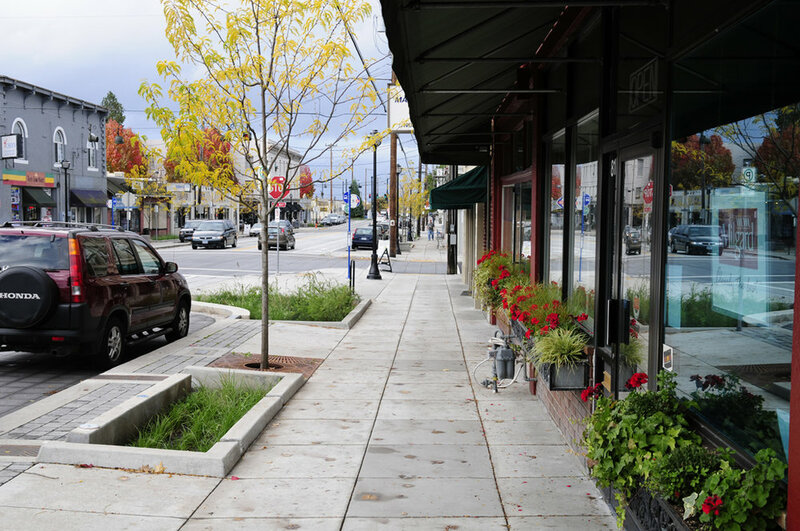 As a main street and ODOT-designated freight route, we successfully integrated sustainable design with main street design to create a vibrant streetscape. Long suffering from a high storefront vacancy rate, the Kenton downtown now has experienced a boom in new businesses and its local economy. In November of 2014 GreenWorks began a site assessment and preliminary design for the Johnson Creek Oxbow Enhancement Project. The central feature of the site is the namesake “Oxbow” meander, which is bounded on the south by a bypass channel that truncates the oxbow creating an island. The by-pass channel was constructed by the Works Progress Administration (WPA) in the 1930’s and included armoring the creek bed and banks, and creating a fish ladder in the oxbow to maintain fish passage. The goal of the WPA work was to convey flood flows efficiently downstream. It resulted in a confined channel, which is hydrologically disconnected from adjacent floodplains and wetlands, and exacerbates flooding. GreenWorks was charged with providing design strategies for improving floodplain hydrology, riparian and in-stream habitat, and local flood impacts. To support these goals, GreenWorks held a one day charrette, which included members from BES, ESA-Vigil Argimis, and KPFF to discuss and recommend a variety of design strategies for improving the inherent conditions found within the Johnson Creek Oxbow. Recommendations were collected and vetted amongst the consultants and further discussed with BES to determine a set of design alternatives for specific sites within the project area. Project sites were mapped, along with support graphics and images, and cost-estimates, to BES in a comprehensive Pre-Design report, thus allowing BES to prioritize future improvement projects for the Johnson Creek Oxbow area. 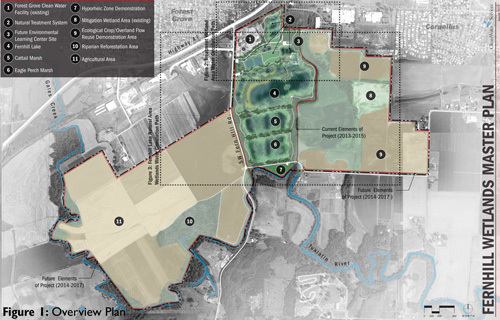 GreenWorks provided landscape architecture services for Portland’s Bureau of Environmental Services Flyway Wetland property located between the Columbia Slough and the Columbia River near the Portland airport. 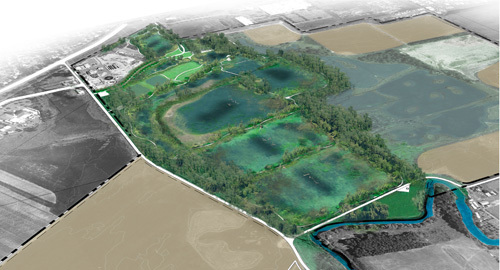 GreenWorks led a team to provide several wetland restoration concepts and a wetland delineation report. GreenWorks headed several workshops with the consultant and team to develop the preferred concepts based on goals for the project including: water quality improvement; vegetation and habitat restoration; wetland hydrology improvement; and floodplain wetland hydrology improvements. Wetland and Stream Delineation Reports and Wetland Restoration Concepts were created for internal analysis related to bureau’s goals for restoring the site and their overarching restoration goals for bureau’s environmental group. In January 2010, GreenWorks and BES staff conducted intensive field work locating and documenting potential locations for stormwater facilities throughout the Columbia Slough Watershed in North Portland. The Columbia Slough has been designated a high priority area by the City of Portland for improving watershed health and reducing pollutants. The project team focused on four target areas where green street facilities would maximize stormwater quality treatment and capture contaminated sediment before being discharged into the Slough. Each potential green street facility was ranked based on its potential performance, feasibility, and cost. GreenWorks assisted BES in project prioritization and provided an overall ranking using Geographic Information Systems (GIS). Over 150 potential green street facilities were identified, which would potentially result in stormwater treatment from over 35 acres of impermeable surfaces. GreenWorks has worked over the past several years with City of Albany staff to develop stormwater quality standards for development to meet DEQ regulatory requirements. The products include new and updated sections of City Administrative Codes, Development Codes, Engineering Standards, Standard Construction Specifiations, and Standard Drawings. The draft products are currently in the public review process, with adoption and implementation tentatively planned by the end of 2014. Draft documents are all available for review on the City of Albany/Public Works/Engineering web page. The City of Coos Bay received federal funding to install bike lanes, landscape strips, and sidewalks to Empire Boulevard between Newmark Avenue and Wisconsin Avenue to provide alternative transportation opportunities along this heavily traveled corridor. Improvements include widening the existing two-lane road to make room for on-street parking and bike lanes, installing curb, gutter, landscape strips with street trees, and sidewalk on both sides of the road. Stormwater / water quality facilities are constructed to manage stormwater on-site, converting Empire Boulevard into a ‘green street’. 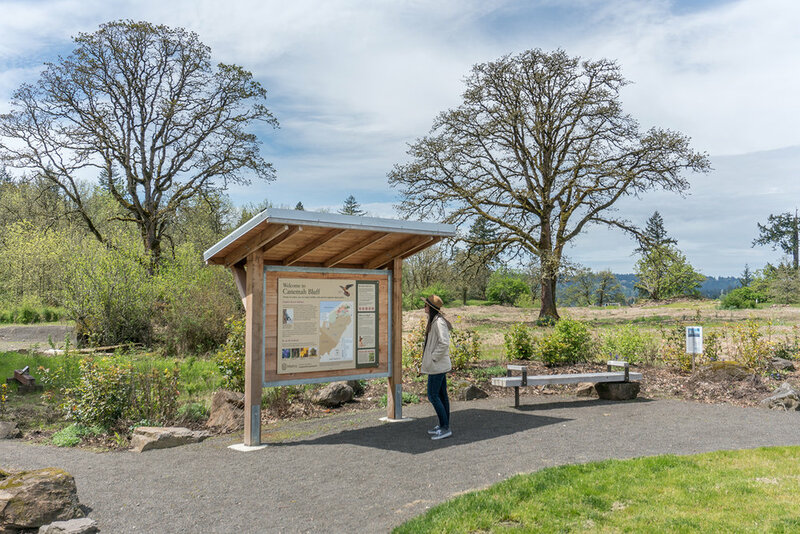 Other project elements include interpretive overlooks with site furniture, illumination, signing, striping, and numerous driveway connections.